employees and customers to the floor, and proceeds to rob multiple tellers. white or gray hair, 5’10” – 6′ tall, medium build and weighing 180-200 lbs. heavy smell of alcohol on the bandit’s breath. assault occurred at a Citibank in La Crescenta on 12/26/08. This entry was posted in La Canada and tagged 211, La Canada, La Crescenta, sleeves bandit by Frank Girardot. Bookmark the permalink. 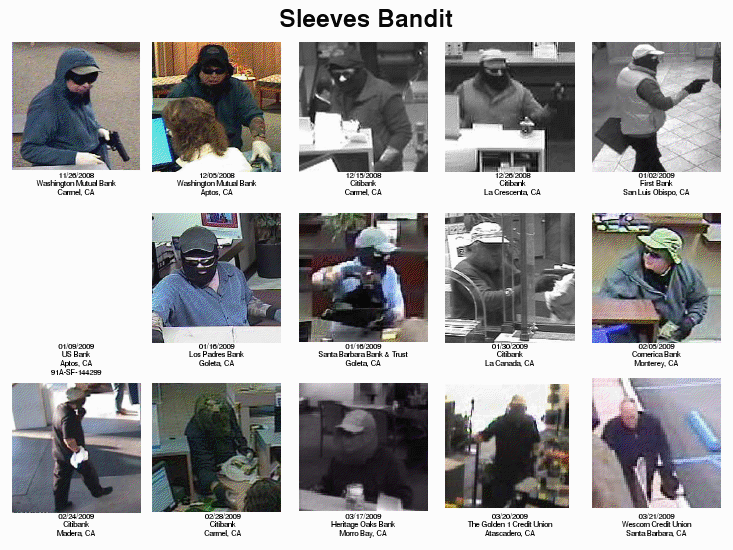 Excellent re-cap by SGVN and again proved that costly cool digital ‘security’ cameras do not deter bank robberies, bad boys couldn’t care less; Goofy Hat, Salt & Pepper etc., you just end up with dozens of photos of the same guy flipping you off. 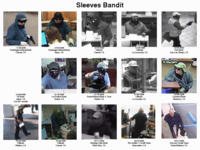 for identifying Bank Robbers and Terrorists….. check FBI Website, click Press Releases. Good blog, make the population aware of the thieves, and peopl can contact the FBI if the see them thieves. but after viewing the pic i see it a bit hard to distinguish the faces on the photo, as they are covered up. I just read an article in Wired magazine that talks about how they are compiling a search-able database that matches fuzzy video captures of tattoos with criminal tattoo owners. I found that very interesting when related to this blog entry. I’ll Twitter this article since it’s interesting.